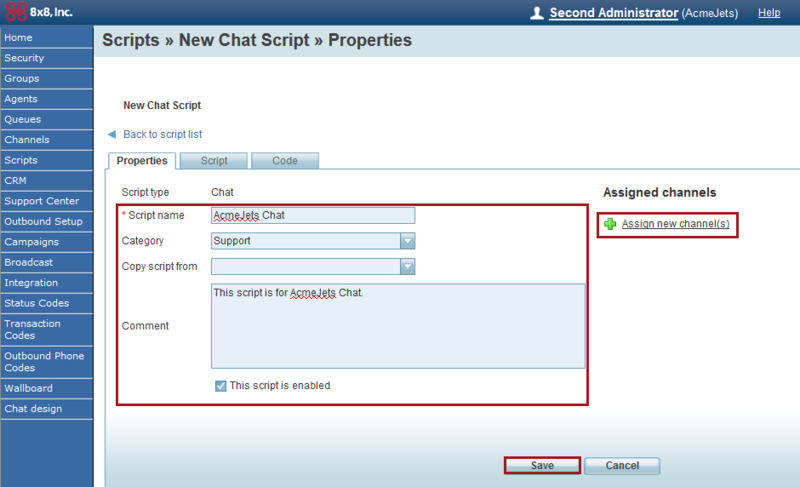 The enhanced chat-scripting engine now allows you to design and control the chat flow in a contact center. 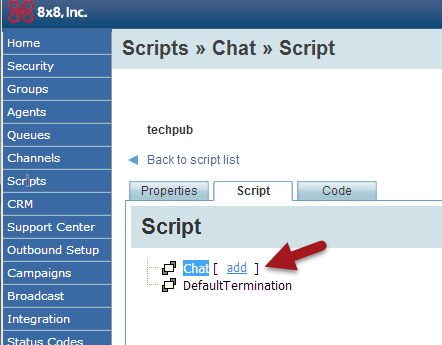 You can associate a chat script with one or more chat channels. 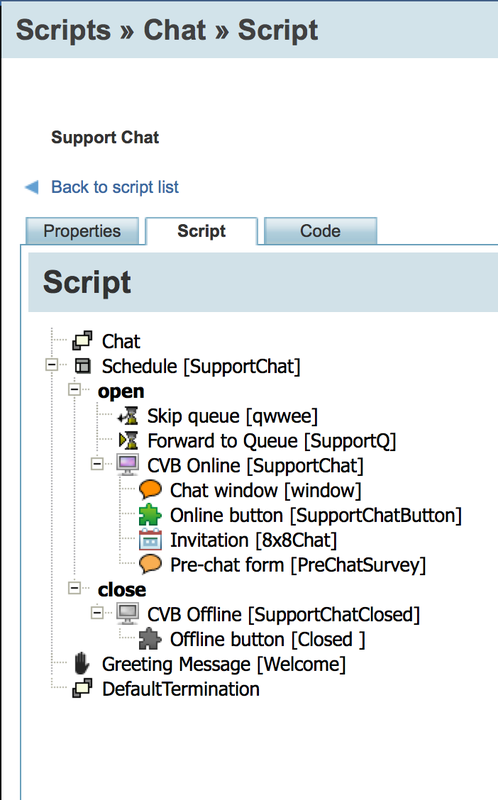 To see the chat workflow diagram, refer to Configuring Embedded Chat Design. Navigate to Scripts in the navigation menu. In the Properties tab, enter a Script name. Select a Category from the list. To create a new category, click Edit Categories. Choose Copy script from if you wish to use an existing script. Select This script is enabled if you wish to enable the script. 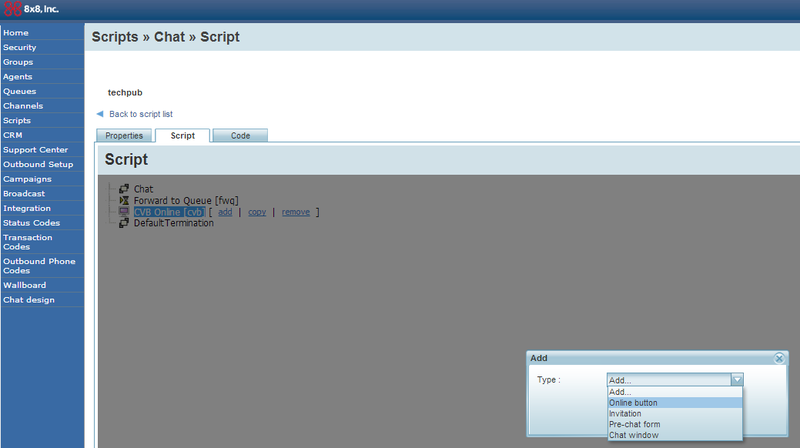 Click Assign new channels to assign the new script to an existing channel. Note: If you select a channel and click Assign the channel's previous script will be permanently replaced by the new script. You can assign one script to multiple channels. But each channel can have only one script. In the Script tab, click Chat. The [ add ] hyperlink appears. Click [ add ] next to Chat. Choose CVB Online and enter a name. Click [ add ] again. Choose Forward to Queue and enter a name. Select a queue name from the Add window and click OK. Forward to Queue appears in the next line. Click [ add ] next to CVB online. Choose Online button from the list and enter a name. Select a window such as 8x8 online custom and click OK. Note: As long as you have all the objects in the code, the sequence does not matter. The backend arranges the script in the right order. In the Code tab, select the chat channel from the list. Click Generate Code. The code appears in the window. 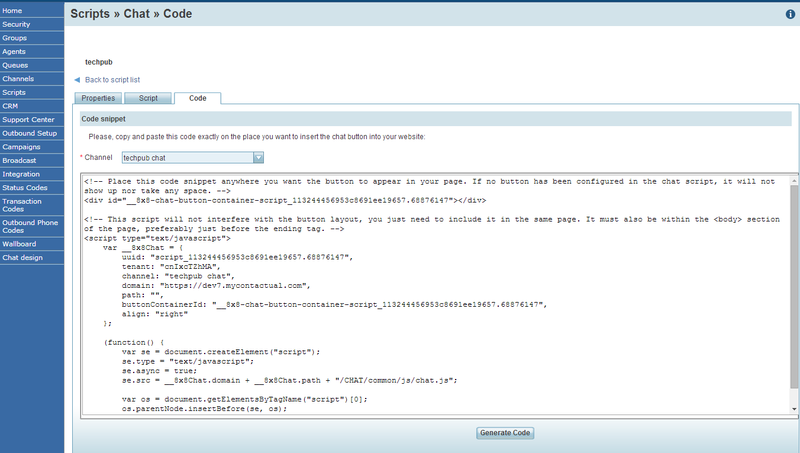 Copy and paste the code to a page where you want to insert a chat button on your website. Note: This script does not interfere with the button layout. It must be included in the same page and within the body section of the web page, preferably just before the ending tag. Click the Chat button you just created. The Chat window opens. The following table summarizes the objects available for a chat script. Use the object to check if the chat request came in when the business is open, closed,or exception hours. Use this object to give the customer the option to send an email instead of waiting for the chat. Forwards the chats to a chat queue such as Sales or main queue. 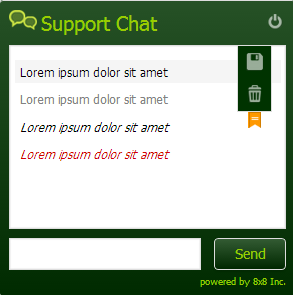 Chat Visual Block Online refers to a chat design element such as a chat button or chat form which can be used on your website during business hours. Chat Visual Block Offline refers to a chat design element such as a chat button or chat form that activates on your website during closed hours. Chat Visual Block Default refers to a chat design element such as a chat button or chat form available by default from Virtual Contact Center. Use this object to type a greeting message to invite the chat enthusiasts to the chat session. Use the Test Queue object to check the condition of a queue before entering a queue.